Cross-posted from the EA Forum. There are between 4.2 million and 7.8 million pet snakes in the world. 160 million to 2.1 billion vertebrates are killed for pet snake food every year. Most of the vertebrates seem to be farmed mice. Feeder mice are killed when they are anywhere between 48 hours and more than 9 months old. Most seem to be slaughtered when they are less 3–4 weeks old. Farming of feeder animals seems to involve considerable suffering because they are often living in cramped and possibly unsanitary conditions, which don’t have shelters to hide in, lack daylight and activities. I haven’t figured out what possible interventions in this space could be particularly promising. It’s possible that the problem is not very tractable. In this article, I first estimate the number of animals raised for pet snake food in the world. Then I discuss some welfare concerns of these feeder rodents by comparing the conditions in which they are raised to the ones recommended for pet mice. Finally, I brainstorm about possible interventions. This article is a part of a series of articles by Rethink Priorities about animals farmed for various purposes. We are also planning to write about fish farmed for fish stock enhancements, and considering writing about the mortality of farmed food animals. Finally, we will create a list of estimates of numbers of animals kept in captivity for various purposes. After that, we may create a similar list of estimates of numbers of wild animals humans affect in various ways. The main goal of the series is to uncover sources of animal suffering that other organizations could tackle with cost-effective interventions. After writing this exploratory article about feeder rodents, I remain largely uncertain about the scale and especially the tractability of this problem. I look forward to reading opinions about it in the comments. I first estimate that there are 4.2–7.8M snakes bred to be pets in the world and that on average they are fed 0.6–1.8 vertebrates per week. I then use these numbers to estimate that 160M–580M rodents are killed for pet snake food per year. I then look at some figures of frozen mice sold in the U.K. from the Federation of British Herpetologists and use them to estimate that 540M–2.1B rodents are killed for pet snake food per year. Finally, I make some hypothesis about why the two estimates differ so much, and combine the two confidence intervals into one by taking the lower bound from the first estimate and the upper bound from the second estimate. For brevity, in the article I use K for a thousand, M for a million, and B or a billion. Many details of the estimations can be seen in the Guesstimate model. Readers who are uninterested in the details of the calculation can skip this section. According to the American Veterinary Medical Association (2012), there are 1.15M snakes in the U.S., owned by 550K households. According to the same source, in 2007 there were 586K pet snakes in the U.S. Publicly accessible information did not explain how these numbers were estimated. This Pultizer Center article claims that “it is estimated that up to one one million people own exotic pets in China. These pets are defined as non-traditional ones, such as snakes, monkeys, crocodiles, spiders, and tropical birds that are sourced from threatened ecosystems across the world.” It also claims that owning exotic pets is quickly becoming more popular in China. A survey by Animal Medicines Australia found that there are ~415,000 reptile pets in Australia (sample size was 2K respondents). This quora thread suggests that pet snakes may be rare in India. A New York Times article claims that "Exotic reptiles and amphibians began surging in popularity in the early 1990s, not only in the United States but also in Europe and Japan.” I haven’t found any other mentions of pet snakes in Japan. Various articles mention that in Indonesia snakes are sometimes kept as pets, as well as used for food, performance, and massage. Using this information and some other information, I estimated that there are between 3.8M and 6.9M pet snakes in households around the world. See my guesstimate model for the estimation. The model includes guessing the number of snakes per 1000 people in countries for which I couldn’t find statistics. Some snakes that are bred to be pets are in pet stores and snake breeding facilities. For example, in Blackpool, UK (population 140K) there are at least two shops that sell snakes. I visited one of them and counted 126 snakes on its shelves, which is almost 1 per thousand people. This shows that the number of snakes in pet shops is significant. I guess that the percentage of such snakes that are yet to be purchased is somewhere between 3 and 20%. With this taken into account, I estimate that there are 4.2–7.8M snakes that are bred to be pets. Adult milk snakes can be fed once every two weeks as they can become overweight if fed weekly. It’s possible that some owners choose to feed adult snakes multiple smaller mice rather than one big mouse/rat. Or that some people feed them more often than guides suggest. Manual of Exotic Pet Practice mentions that “snakes are often overfed in captivity.” This informal poll shows that many owners feed one rodent per week and quite many feed more. I also asked how often snakes should be fed at one reptile store and I was told that almost all of their snakes are fed one mice of appropriate size per week, while few bigger snakes are fed more often. Note that mice are not the only animals snakes eat. A PetHelpful article claims that there are pet snakes that eat chicks, fish, insects, eggs, and reptiles. VCA Animal Hospitals claims that the most popular pet snakes usually eat prey such as mice, rats, gerbils, and hamsters. Larger pet snakes will also eat whole rabbits. At the extreme end, this itv news report about possibly the longest pet snake in the UK claims that it eats 3 rabbits per week. Based on all this information, I guess that on average pet snakes eat 0.6–1.8 vertebrates per week, which is 31 to 94 vertebrates per year. To calculate it, I multiply the number of snakes in the world by the number of animals they eat per year. I also guess that 3%–20% of snakes kept to be pets are in pet stores and breeding facilities. After taking that into account, I get a 90% subjective confidence interval that there are 160M–580M animals fed to pet snakes per year. This Independent article claims that 180M rats and mice were raised in the U.S. in 1999 and that 93% of them were sold as reptile food (other 2% were sold as pets, the rest were used in research). It also claims that there is still a significant shortage of rodents. These figures are especially surprising because it seems that snakes are becoming more popular in the U.S., but it could be that they were briefly very popular around 1999. The article also mentions that there are 20M reptile owners in the U.S., but I’m not sure I trust this claim. This HSUS document claims that “more than 3.9 million households in the United States contained one or more pet reptiles or amphibians in 2000”. Assuming an average household size of 2.6, that is 10M owners, not 20M. And some of the 10M only kept amphibians. 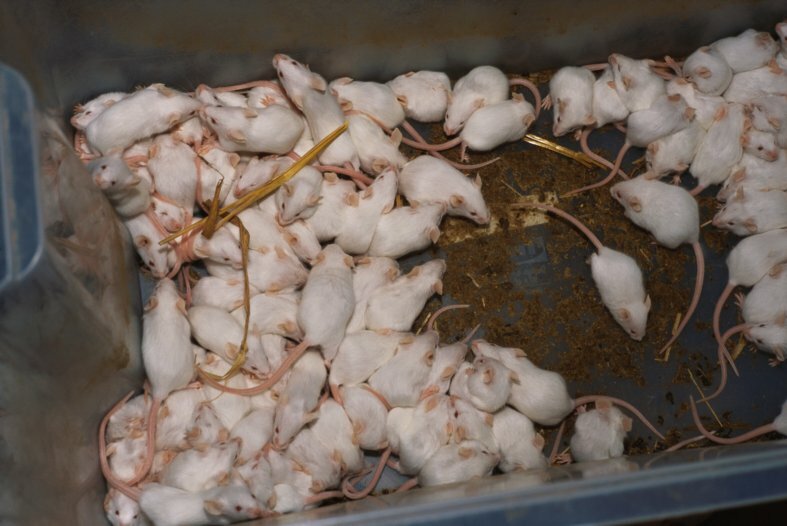 Federation of British Herpetologists' (FBH) website claims that over 1M frozen mice are sold each week for snake food in the UK and that additional ~3.5 tons of frozen rodents are imported from outside the EU each month. It’s based on a 2008 survey by REPTA which I was unable to find. FBH also used this and other sales of specialists reptile food data to determine that there are “over 1.2 million households were home to over seven million pet reptiles” in the UK. Even though FBHs estimates are cited by Telegraph (a respected news source in the UK), I’m not sure I trust this conclusion because PFMA’s surveys consistently estimate that the number of reptile pets in the UK is less than a million. It’s possible that FBH themselves don’t know why so many frozen rodents are being sold or that they are (intentionally or not) inflating the figures. 2012 FBH’s brochure claims that an estimated 2M frozen mice are sold for snake food in the UK each week and also cites REPTA as the source. That is 104M per year for the UK alone. Note that these numbers are only for sold frozen mice, but some people feed their snakes rats, day-old chicks, or other animals. Contrary to what FBH claims, many frozen mice are used for things other than snake food. According to a Pet Age article, ”the feeder rodent industry may be the lifeblood for snake breeders and snake keepers, but it also serves animal collections at zoos and museums and some ravenous raptors at wildlife rehabilitation facilities.” The article also claims that bald eagles can eat 15 frozen mice in a sitting and that crows and swallow-tailed kites eat small mice. What is more, some lizards, frogs and other pets also eat rodents. There are more snakes in the U.K. and in the U.S. than surveys suggest because surveys don’t capture a few owners who own many snakes. The combined sample size of PFMA’s surveys is more than 24K. Even though it is big, it could be insufficient. If few owners own many snakes, PFMA’s surveys might have failed to catch any such respondents and consequently underestimated the number. According to the PFMA’s surveys, snake-owning households on average own 1.8 snakes. Figure 5 in Clark (2012) shows that out of 656 respondents who owned a snake, 367 owned 6 six or more of them. Survey did not have a representative sample because it was “distributed over the reptile keeper’s networks on the internet,” but it still indicates that there are people who own many snakes. Some sold frozen mice end up not being fed to any animal. In the U.S., human food waste is estimated at between 30–40 percent of the food supply. Maybe some pet food is wasted as well. Frozen mice are cheap, especially if they are bought in bulk. Owners could be buying more than they need but probably not much more because it takes up freezer space. Force-feeding snakes. Some articles mention that some owners overfeed their snakes because they want them to become bigger. Instead of feeding adults snakes bigger mice, some owners choose to feed them many small mice. This would increase the number of used mice a lot but I haven’t seen much evidence of that happening. Mortality rates during transport and in pet stores. In the end, even though I don’t trust FBH’s numbers, I don’t trust my estimation in the previous section much either, and the FBH’s numbers are the only direct rodent sales numbers I found. In the guesstimate model, I use FBH’s numbers to produce an alternative calculation. First I calculate the number of rodents fed to pet snakes in the U.K. To do that, I multiply FBH’s figures (1M–2M frozen mice per week which is 52M–104M per year) by the proportion of frozen mice that are sold as food for pet snakes. As mentioned before, frozen mice can also be used to feed to some other pet animals, and used at zoos and wildlife rehabilitation centers. I don’t know the value of this proportion is, but I guess that it is between 50% and 97%. I then divide it from the proportion of vertebrates produced for pet snake food that is frozen mice. As mentioned before, some snakes are fed rats, chicks, rabbits or other animals but farmed mice seem to be by far most popular, at least in the U.K. Consequently, I guess that the proportion is between 80% and 95%. Finally, I use my estimate that 4–9% of world’s pet snakes are in the UK, to estimate that 540M–2.1B vertebrates are killed for pet snake food in the world each year. Note that I assume that the ratio of snakes to mice in the UK and the world is the same, which might not be correct. Furthermore, I could have incorrectly estimate the proportion of pet snakes that live in the UK. This estimate barely overlaps with my previous estimate that 160M–580M animals fed to pet snakes per year. This makes me doubt both of my models, so I take the lower bound from one estimate, and upper bound from the other, and end up with a 90% subjective confidence interval of 160M–2.1B vertebrates are killed for pet snake food in the world each year. For comparison, Prize (2014) estimates that around 118M animals are used for experiments, although it claims that this is likely an underestimate. It seems that most of the vertebrates fed to snakes are farmed mice, though I’m not sure what the percentage is, especially outside of the U.K. and the U.S. According to Aust, et al. (2016), in China and Vietnam they are usually fed wild-harvested natural food (e.g.amphibians and rodents), waste protein from other industries (e.g., poultry and pork), formulated diets (reconstituted waste protein), and snake meat for King Cobras. This news article talks about a snake farm in Thailand that breeds mice to feed them. The practice was called into question by local officials who were concerned that this may violate a newly passed Animal Welfare Act. It’s unclear what was the resolution and whether such practice is common. Overall, it’s unclear how many of snakes farmed for other purposes are fed farmed mice but it seems that farmed mice is not the most common food for these snakes. To determine the scale of suffering endured by feeder animals, we need to consider not only the numbers but also how long on average animals live and suffer in factory farm conditions. In this section, I look at conditions in which feeder rodents live in farms and compare them with the conditions that are recommended for laboratory and pet mice. Then I briefly discuss concerns about live feeding. This section was reviewed by a veterinarian who wished to remain anonymous. They confirmed my impression that conditions seen in the videos and pictures below are bad. They also told that conditions for feeder rodents they witnessed at a zoo and at a pet store were similar. Video 1: a short video of a large feeder mice farm. Video 3: the video description says that it’s “mice at a farm crammed in a little box before being served to snakes.” Conditions look very bad. Some of the mice seem to be already dead. It’s unclear if these are conditions in which they were grown as well. Video 4: another video that might be representative of how most feeder rodents are raised. Video 5: in the beginning shows how some people may raise few rats for their own snakes in pretty good conditions. Then shows a larger scale farm that is similar to others. Pictures 1 and 2 (see below): I found these pictures at alarmy.com where both of them were titled “White Mice grown for live reptile feed on farm” and uploaded by the same author. Presumably, the first picture shows how one of the containers seen in picture 2 looks inside. The pictured conditions seem very bad. RSPCA guidelines for keeping pet mice explain that “wild mice can have very large territories. Mice need sufficient space to display natural behaviors and give control/choice over their environment.” petsworld.co.uk claims that the minimum cage size for a pair of pet mice is 45cm x 30cm (1350 cm2) with at least 25cm depth. In video 1 there are 50 mice in a box that seems to be smaller than 1800cm2, maybe even 1000cm2. In some other videos the situation appears to be better, but in video 3 and picture 1 it is much worse. A veterinarian said that in most of the videos a lot of feces can be seen within the bed of all the drawers. Pet mice usually choose a toilet corner, but it doesn’t always happen. I find it unlikely that all rodents pick the same corner when living in such cramped conditions. And even if they do, feces might accumulate quickly. In video 2, the man claims that he cleans containers every “week or week and a half.” According to this page, this might be insufficient even when mice are not cramped. Fawcett (2012) gives detailed instructions for shelters that have to be provided to lab mice. Similarly, RSPCA guidelines explain that “mice are a prey species; they’re highly motivated to stay near cover.” It claims that they need tubes for hiding or sleeping in, shelters with multiple exits where mice could hide when they wish, and avoid any confrontation with other cage mates. In all cases, cages for feeder mice don’t include any shelters. Living in such cramped conditions without places to hide might be causing a lot of stress to mice, especially if some of them become aggressive. Both, RSPCA and Fawcett (2012) claim that mice should always be monitored to check that cage mates do not become aggressive. I haven’t seen any indication that this is being done in breeding facilities. Fawcett (2012) claims that “environmental enrichment is essential for all mice.” Similarly, RSPCA says that “running wheels can be provided but shouldn’t be the only enrichment.” Lack of any enrichment in containers is concerning. RSPCA also claims that mice need natural daylight. However, in all videos, they are only exposed to artificial light and in video 1 they seem to spend their time in darkness. RSPCA claims that “mice need bedding material to dig/absorb moisture from urine/faeces” and nesting materials are needed to help body temperature regulation. Bedding materials seem to be present in videos 1, 2, 4 and 5, but they seem to be lacking in video 3 and in picture 1. However, it’s possible that video 3 does not show the environment in which mice spend most of their time. I can’t tell whether nesting materials are provided in any of the videos. It’s unclear whether rodents receive veterinary care when they need it, but I'd be surprised if they do. A veterinarian said that even when sold as pets, mice are often filthy and don’t always receive adequate medical care. The fact that mice conditions are not regulated in any way makes me concerned. However, in the U.S., no federal laws govern the conditions in which farmed animals are raised either. Finally, there is also suffering during feeding. As I understand it, most of the time snake will kill prey very quickly. By looking at 20 YouTube videos of live-feeding, Cooper and Williams (2014) estimated that “the time to death as estimated by cessation of any movement was 62 ± 29 seconds for mice, 54 ± 21 seconds for rat”. However, in some cases, snake may not be hungry, and a rodent could be stuck in a tank with a predator for days. Raising awareness about the suffering involved in the raising of feeder mice could reduce the number of people willing to buy snakes. On the other hand, it might also raise awareness about snakes as possible pets and could lead to more people acquiring pet snakes. Overall, I don’t think it’s a good approach. Improving conditions for breeder mice via corporate campaigns (similarly to the way it’s done in the food industry). It might be a bad idea because such campaigns could make it seem that keeping exotic animals as pets is acceptable, which could increase their quantity. Corporate campaigns that encourage pets stores to stop selling feeder mice and snakes. This petition is an example. General pet stores need the support of general animal lovers, but specialized reptile stores may not care. It could also raise awareness of pet snakes as an option which is bad. Pet snakes are illegal in Iceland to prevent diseases. There was an initiative to ban exotic pet trade in Wales. Some species of snakes are banned in the U.S. There are plans to ban third-party sales of puppies and kittens in the U.K. Lobbying to increase legal requirements for owning and selling snakes might be possible. In Australia, They seem to be quite complex already. That may decrease the number of pet snakes. Enforcement of existing standards. I found four cases of feeder rodents being confiscated due to unacceptable living conditions. One case was in Scotland where, following an inspection by a charity, a man was jailed for contraventions of the Animal Health & Welfare (Scotland) Act of causing unnecessary suffering to rodents he raised to feed his pet snakes. Other three cases are in various U.S. states. One of them resulted in the closing of a farm of about 30,000 mice and an arrest. Conditions for feeder rodents are not regulated by federal U.S. laws, so I’m unsure what regulations were used as a basis of all these confiscations. In any case, there could be ways to make sure that more such prosecutions happen. It would eliminate the worst farms and encourage breeders to ensure less cruel conditions for feeder rodents. Lobbying to have more legal requirements for how feeder rodents are raised. Could be the same requirements as for lab animals. The claim is easy to make: why would we treat animals of the same species differently just because they are used for a different purpose? Encouraging alternative feed sources. Aust, et al. (2016) mentions some farms using reconstituted waste protein. Maybe a small proportion of owners would be open to switching to something like that, but I find it unlikely. Creating an organization that grows feeder animals in very good conditions. It would either sell them at a higher price to owners who care about animal welfare or partly sustain itself from donations. My intuition is that trying to ban the sale of snakes in pet stores is the most promising intervention, but I'm very uncertain. I also don’t know if any of these interventions would be cost-effective compared to ACE’s top charities. It also claims that the snake might live for up to 30 years. That means that over its lifetime it might eat over 4K rabbits. According to AVMA (2012), there are 1.15M snakes in the U.S., owned by 550K households. According to the same source, in 2007 there were 586K pet snakes in the U.S. This 2018 article claims that herps (non-avian reptiles and amphibians) are becoming increasingly popular and mainstream and that sales of their food are increasing. This 2013 Pet Age article claims that “over the past 25 years, the feeder rodent industry has grown substantially”. Furthermore, I find it hard to believe that there are more pet reptiles than dogs in the UK. The page also recommends to use a 20-gallon aquarium for a group of five or six mice. In a pet store I was told that feeding live mice is illegal in the UK due to animal welfare concerns. If that is really the case, it shows that legislative progress in this area is possible. "34% (83/246) of Minnesota Salmonella cases who reported reptile exposure reported feeding their reptile some type of rodent – 87% (72/83) of snake owners reported feeding them rodents. Among those who fed rodents: – 59% (47/80) fed frozen rodents – 41% (33/80) fed live rodents." However, this is not a representative sample and live mice may be more prone to cause salmonella. I think that such campaigns could gain public support because the suffering of feeder rodents is more obviously unnecessary than the suffering of animals raised for human food or used for experiments. Non-vegetarians would feel less cognitive dissonance about supporting it. Furthermore, fewer people doubt rodents’ ability to suffer than chickens’ or fish ability to suffer. Rodents are also often featured in campaigns against animal testing which is a cause that has received a lot of attention relative to its size. This indicates that people can care about rodents even if they don’t seem like the most popular animals. The American Veterinary Medical Association. 2012 U.S. Pet Ownership & Demographics Sourcebook. Aust P., Tri N. V., Natusch D., Alexander G. J. 2016. Asian snake farms: conservation curse or sustainable enterprise? Clark, B. 2012? A Report Looking at the Reptile Keeping Hobby, Those Who Want it Banned and Why? ENDCAP (2012). Wild Pets in the European Union. Hardin S. 2013. 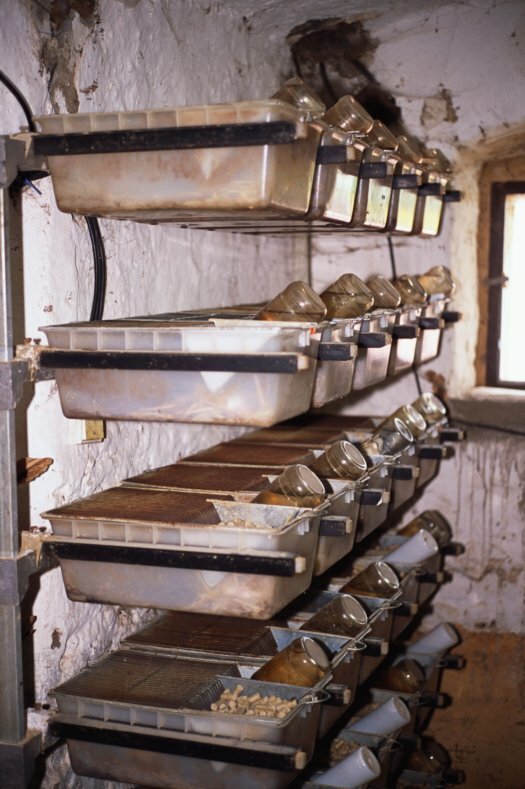 Best Management Practices for Feeder Rodent Production and Distribution. Prize, L. 2014. A global view of animal experiments 2014. Fawcett, A. 2012. Guidelines for the housing of mice in scientific institutions. This essay is a project of Rethink Priorities. It was written by Saulius Šimčikas. Thanks to Daniela R. Waldhorn, Marcus A. Davis, and Peter Hurford for reviewing drafts of this post and making valuable comments. EA Survey 2018 Series: How welcoming is EA? Will companies meet their animal welfare commitments?